If you are a commercial trucker in North America, chances are you are going to have to cross the border with commercial goods at some point in your career. You may have to do it multiple times on a daily basis depending on whom you work for. Cross border trucking is different than simply domestic work and there are some things that you will have to keep in mind in order to ensure that you, your company and your goods are protected. Below are four things you need to know about cross border trucking. Responsibility. U.S. Customs and Border Protection (CBP) holds you responsible and liable for the cargo while it is in your custody until the point where you finally release it to a warehouse, the final recipient in the United States, or until it gets exported to a foreign country. Bonding. Before you are able to transport commercial freight across the border, you must have an international carrier bond on file with CBP that certifies you to carry freight across borders. This is not a complicated process and can be typically filed with the port of entry/exit that you would most commonly be using while working. Certification. In addition to having that bond, you will also be expected to have participated in the Free and Secure Trade program (FAST), which promotes free and secure trade within NAFTA. Once you are approved, they will issue you a FAST card, which you are to keep on you at all times during the course of your work. In order to be certified by FAST, every link in your supply chain needs to have a Customs-Trade Partnership Against Terrorism certification that extends from manufacturer to carrier, importer and driver. User fee decal program. You will also be subject to user fee decal program charges that are incurred in order to cover the inspection process used by customs to inspect commercial trucks. 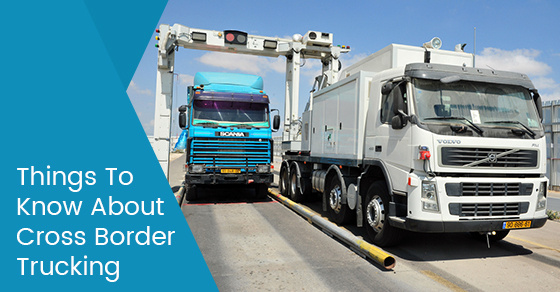 Before transporting commercial freight across the border you should make sure that you notify the broker or the importer of their arrival across the border so they can be filed and cleared with CBP. If arrangements aren’t made in advance, than you as the transporter are responsible for clearing the goods as well as filing the cargo information in advance with an interchange. Trucking across borders definitely has its rewards and its challenges, as well as a unique set of rules and regulations that govern international trade. Make sure you know your obligations and liabilities before you proceed, and ensure that you don’t encounter anything unforeseen and that you get your cargo from point A to point B safely and securely.